We have devised an ex vivo culture system which generates large numbers of eosinophils at high purity (>90%) from unselected mouse bone marrow progenitors. In response to 4 days of culture with recombinant mouse FLT3-L and recombinant mouse stem cell factor followed by recombinant mouse IL-5 alone thereafter, the resulting bone marrow-derived eosinophils (bmEos) express immunoreactive major basic protein, Siglec F, IL-5R α-chain, and transcripts encoding mouse eosinophil peroxidase, CCR3, the IL-3/IL-5/GM-CSF receptor common β-chain, and the transcription factor GATA-1. BmEos are functionally competent: they undergo chemotaxis toward mouse eotaxin-1 and produce characteristic cytokines, including IFN-γ, IL-4, MIP-1α, and IL-6. The rodent pathogen pneumonia virus of mice replicates in bmEos and elevated levels of IL-6 are detected in supernatants of bmEos cultures in response to active infection. Finally, differentiating bmEos are readily transfected with lentiviral vectors, suggesting a means for rapid production of genetically manipulated cells. Eosinophils are among the most enigmatic of all cells of the immune system. In the recent past, much about their basic biology, the nature of their effector functions, and roles played in various disease states has come under renewed scrutiny (1, 2). Eosinophils have long been perceived as direct pathophysiologic mediators in respiratory allergy and asthma, and consensus opinion is that they remain viable targets for the amelioration of the acute and chronic sequelae of these diseases (3, 4, 5). The failed therapeutic trials with humanized anti-IL-5 mAbs (6, 7), which have been attributed to ineffective eosinophil clearance from lung tissue, point to a need for alternative approaches to acute eosinophil ablation. Several groups have considered the possibility of eliminating eosinophils directly via targeting the IL-5Rα and/or the IL-3/IL-5/GM-CSF common β-chain (βc)3 or by inducing apoptosis via ligation of eosinophil-specific cell surface targets (reviewed in Ref. 8). However, given the recent findings on the role of eosinophils in promoting host defense against respiratory viruses (2, 9), it is not clear that eosinophil ablation will be without caveats or negative sequelae vis-à-vis respiratory virus infection. Toward this end, it would certainly be advantageous to have a clearer understanding of eosinophil biology, including a more thorough characterization of the unique features of eosinophil progenitors. Among the difficulties encountered in this endeavor, eosinophil-specific events represent only a fraction of the ongoing hematopoietic activity in bone marrow at any given time, even under profound Th2 stimulation (10, 11). 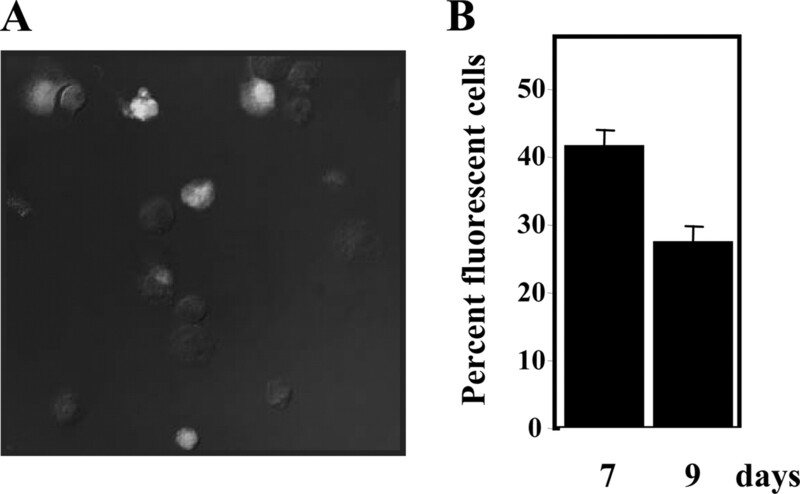 To date, cytokine-stimulated ex vivo culture conditions have not been very effective at generating large quantities of pure, phenotypically mature eosinophils from unselected bone marrow progenitors. For example, in our earlier study (12), culturing unselected BALB/c mouse bone marrow progenitors in a standard cytokine regimen that included IL-3 and GM-CSF yielded increased cell numbers but only 5–6% eosinophils. In contrast, in an earlier study by Ishihara et al. (13), culture of rat bone marrow progenitors in IL-5 alone resulted in 90% eosinophils, but a 4-fold reduction in total cell number. In this manuscript, we describe a cytokine regimen that promotes the replication and differentiation of unselected bone marrow progenitors toward phenotypically mature eosinophils and we characterize the functional properties of these ex vivo- differentiated eosinophils including their interactions with the natural rodent pneumovirus pathogen, pneumonia virus of mice (PVM). We also discuss the utility of these cells for studies related to eosinophil differentiation in vivo reconstitution. Bone marrow cells were collected from the femurs and tibiae of wild-type BALB/c mice (Taconic Farms) by flushing the opened bones with IMDM (Invitrogen). RBC were lysed in dH2O followed by the addition of 10× PBS. After centrifugation, the cells were washed once in PBS containing 0.1% BSA. The bone marrow cells were cultured at 106/ml in medium containing RPMI 1640 (Invitrogen) with 20% FBS (Cambrex), 100 IU/ml penicillin and 10 μg/ml streptomycin (Cellgro), 2 mM glutamine (Invitrogen), 25 mM HEPES and 1× nonessential amino acids and 1 mM sodium pyruvate (Life Technologies), and 50 μM 2-ME (Sigma-Aldrich) supplemented with 100 ng/ml stem cell factor (SCF; PeproTech) and 100 ng/ml FLT3 ligand (FLT3-L; PeproTech) from days 0 to 4. On day 4, the medium containing SCF and FLT3-L was replaced with medium containing 10 ng/ml recombinant mouse (rm) IL-5 (R&D Systems) only. On day 8, the cells were moved to new flasks and maintained in fresh medium supplemented with rmIL-5. Every other day, from this point forward, one-half of the medium was replaced with fresh medium containing rmIL-5, and the concentration of the cells was adjusted each time to106/ml. Cells were enumerated at day 0 and on days indicated thereafter in a hemocytometer, and 50,000 cells were subjected to cytospin (Thermo Shandon). The cytospin preparations were fixed and stained using a modified Giemsa preparation (Diff Quik). Mouse bmEos were suspended in RNAzol B (Tel-Test) at a concentration of 1 ml/106 cells and extraction proceeded as per the manufacturer’s instructions. The precipitated RNA was harvested by centrifugation, washed in 70% ethanol, dried, and suspended in sterile diethyl pyrocarbonate (DEPC)-treated water. Two micrograms of RNA prepared as described was subjected to DNase I treatment (Invitrogen) and reverse transcribed using a First Strand cDNA Synthesis Kit for RT-PCR (avian myeloblastosis virus reverse transcriptase; Roche Diagnostics). One microliter of cDNA was subjected to TaqMan (Q) PCR using a FAM-labeled probe and primers to each indicated mouse gene. All primer probe sets were purchased from Applied Biosystems (eosinophil peroxidase (EPO), Mm00514768_m1; major basic protein (MBP), Mm00435905_m1; GATA1, Mm00484678_m1; GATA2, Mm00492300_m1; GATA3, Mm00484683_m1; IL-5Rα, Mm00434284_m1; IL-3Rα, Mm00434273_m1; GMCSFRα, Mm00438331_g1; common β-chain, Mm00655745_m1; CCR3, Mm00515543_s1; and MPO, Mm00447886_m1). All experiments included a no-reverse transcriptase and no-template controls and mouse GAPDH (ABI no. 4308313) was used as the endogenous control. Transcripts at each time point are normalized to GAPDH to account for variations in initial template concentration and then reported relative to expression at day 0. Values are mean ± SEM of cultures derived from mice. Cells derived from ex vivo culture of mouse bone marrow were probed with the indicated Ab or isotype control in PBS with 0.1% BSA for 30 min at 4°C. After staining, the cells were washed with PBS with 0.1% BSA, fixed in 4% paraformaldehyde, and analyzed by flow cytometry. Data were acquired with a FACSCalibur flow cytometer (BD Biosciences) and analyzed with FlowJo software version 7.1 (Tree Star). Positive cells were identified by comparison to the appropriately conjugated isotype control. Abs (all from BD Pharmingen) used included PE-conjugated rat anti-mouse Siglec F or PE-conjugated IgG2A6 isotype control, allophycocyanin-conjugated anti-mouse Gr-1/Ly-6C, Alexa Fluor 488-conjugated anti-mouse IL-5Rα/CD125, and PE-conjugated anti-mouse CD11b. One million bmEos were washed with 3 ml of 0.1%BSA in PBS (BSA/PBS) and then fixed and permeabilized by FIX & PERM (Caltag Laboratories) per the manufacturer’s protocol or by fixing in 4% paraformaldehyde followed by permeabilization in ice-cold methanol. Rabbit anti-MBP (no. 509 was a gift from Dr. N. A. Lee and Dr. J. J. Lee) was used at 1/5000 for 1 h at 4°C, the cells were washed in BSA/PBS, and an Alexa Fluor 647-conjugated secondary Ab, goat anti-rabbit IgG-Alexa Fluor 647 Ab (Molecular Probes) was applied at a 1/100 dilution. After a 1-h incubation in the dark at room temperature, the cells were washed and the nuclear stain, 4′,6-diamidino-2-phenylindole dihydrochloride (DAPI; Molecular Probes) was added at 1 μg/ml and incubated for 15 min in the dark. The cells were washed two times in BSA/PBS and then fixed onto glass slides using cytofunnels (Thermo Electron). Images were collected on a TCS-SP2 AOBS confocal microscope (Leica Microsystems) using a ×63 oil immersion objective aperture 1.4 at different zoom factors. The confocal pinhole was set to 0.9 Airy units to ensure maximum resolution. FITC was excited using an argon laser at 488 nm, and DAPI, nuclear stain, was excited using a 405-nm diode laser (Coherent). Imaging fields were selected “blinded” in that the microscope was centered on the DAPI-stained nuclei and that field was imaged regardless of the presence or absence of MBP-Alexa Fluor 647-positive cells since Alexa Fluor 647 is far red and not visible to the eye. PVM strain 15 was obtained from American Type Culture Collection and amplified in RAW264.7 cells (14) and stored in liquid nitrogen until use. Virus titer was determined by a quantitative RT-PCR assay that targets the unique virus SH gene as previously described (15). Before challenge of bmEos, PVM strain 15 was thawed and dialyzed against 1000 volumes of 0.5% BSA/PBS (pH 7.5) at 4°C to dilute cytokines elicited from the infected RAW264.7 cell culture. Following 10 days of ex vivo culture, bmEos were plated in fresh medium containing rmIL-5 at 106 cells/100 μl per well in 96-well plates. Cells were treated with equal volumes of virus (PVM), dialysis buffer, or heat-inactivated (HI) PVM (heated to 95°C and flash frozen in a dry ice-methanol bath three times). The cells and virus were incubated overnight at 32°C in a humidified 5% CO2 incubator. At the time points indicated, the culture medium was collected for analysis of secreted cytokines and RNA was collected for determination of virus copy number. The RNA was reverse transcribed as described above and used to determine absolute virus copy number. Absolute virus copy number was determined as described previously (15) with reference to a standard curve generated using serial 10-fold dilutions of the full SH gene as target. The cDNAs were then subjected to a second set of quantitative PCR assays to determine absolute GAPDH copy number. Absolute virus copy number is reported as copies of SH per 106 copies of GAPDH. Cytokine concentrations were determined using a multiplex bead assay (Lincoplex). Both a 16-plex and a 22-plex premixed bead assay yielded similar results. The assay was read on a Bioplex (Bio-Rad) plate reader and the values of the experimental data points were extrapolated from a standard curve generated by the instrument software using a five-parameter logistic method. The assay was performed in a Transwell plate (Corning) with a 5.0-μm pore size polycarbonate membrane. Recombinant mouse eotaxin (R&D Systems) was dissolved in 0.5%BSA/PBS to 10 μg/ml and then further diluted in medium containing rmIL-5 until the concentrations used in the assay were achieved. One hundred microliters of the eotaxin-containing medium was placed in the lower well. One hundred microliters of bmEos at 500,000 cells/ml was placed in the upper chamber. Cells were incubated at 37°C for 3 h to permit migration across the membrane in response to the chemotactic agent. To ensure that the movement across the membrane was due to chemotaxis rather then chemokinesis, a series of experiments was performed in which there was no eotaxin gradient (eotaxin in the upper as well as lower chamber) and a control was included that contained no eotaxin at all. Data are presented as percentage of control (no eotaxin in either the top or bottom well), and data for both the bmEos exhibiting chemotaxis in response to the eotaxin gradient (eotaxin in the bottom well only) as well as those exhibiting chemokinesis (eotaxin in both wells) are shown. The Vivid Colors pLenti6.2GW/EmGFP vector and the Virapower expression system (Invitrogen) were used to infect 293FT cells according to the manufacturer’s instructions. The resulting viral supernatant was collected and concentrated 100-fold by ultracentrifugation, and the viral titer was determined using a p24 ELISA kit (Cell-Biolabs). Day 3 bone marrow cultures were transduced with the lentivirus at a multiplicity of infection of 20 in the presence of 6 μg/ml polybrene (Invitrogen). The cultures were switched into medium containing rmIL-5 at day 4 and maintained as described above. At day 7 (4 days after transduction), GFP fluorescence was assessed with a fluorescent microscope (Leica DMIRBE2) at the Biological Imaging Section of the Research Technologies Branch (National Institute of Allergy and Infectious Diseases, Bethesda, MD) and by flow cytometry (FACSCalibur). Percent positive is based on total cell population, which is ∼70% eosinophils at this time point. Data sets were analyzed using Student’s t test unless otherwise indicated. All data are reported as the mean ± SEM. Freshly isolated bone marrow progenitors are grown in rmSCF (100 ng/ml) and rmFLT3-L (100 ng/ml) for 4 days and in 10 ng/ml rmIL-5 thereafter (full details in Materials and Methods). Our cultures yielded high-purity (>90%) bmEos by day 10 and thereafter (Fig. 1⇓A) as determined by modified Giemsa staining (Fig. 1⇓, B and C) and confirmed by expression of the cell surface Ag Siglec F (Fig. 1⇓D). Total cell number increased >10-fold from the original 3 × 106 bone marrow cells to 36 ± 7 × 106 bmEos at day 17, with linear expansion observed primarily over days 8–15. The doubling time is ∼48 h from days 4–12 (Fig. 1⇓A). The stereotypical bilobed nucleus is featured in the Giemsa-stained bmEos in Fig. 1⇓C; however, as can be seen in Fig. 1⇓B, bmEos exhibit diverse nuclear morphologies, as do mouse eosinophils from peripheral blood (16). Confocal microscopy of bmEos (day 14 cultures) revealed pronounced staining of cytoplasmic granules with polyclonal anti-mouse (m) MBP Ab (mMBP, in red, Fig. 1⇓E) as well as polymorphic nuclei characteristic of mature eosinophils (DAPI, in blue). No staining was seen in the secondary Ab only (data not shown). Interestingly, a fraction of phenotypically mature, granulated bmEos maintain the ability to undergo mitosis. Fig. 1⇓F shows a bmEos in late anaphase. In addition to Siglec F (Fig. 1⇓D), bmEos also express cell surface Ags IL5Rα (CD125), Gr-1, and CD11b (data not shown). Ex vivo culture of mouse bmEos. A, Total cell number (▪) and percent eosinophils (•) in ex vivo bone marrow cultures following differentiation with rmSCF, rmFLT3-L and rmIL-5 as indicated. Light microscopic image; original magnification ×20 (B) and light microscopic image; original magnification, ×63 (C) of bmEos, culture day 9, modified Giemsa stain (D) Flow cytometric analysis of Siglec F expression in three independent mouse bmEos cultures. Inset, histogram depicting typical flow cytometry results using isotype control and anti-Siglec F PE-conjugated Ab. E, Confocal microscopic analysis of day 14-cultured bmEos probed with polyclonal anti-mMBP Ab followed by A647-conjugated secondary Ab and DAPI nuclear stain. Positive mMBP staining is pseudo-colored red while nuclear staining is blue. F, Phenotypically mature cell from day 10 bmEos culture undergoing mitosis (modified Giemsa stain). Relative expression of transcripts encoding eosinophil-specific and eosinophil-related genes was evaluated by quantitative RT-PCR. Relative expression of transcripts encoding mMBP, mEPO, and mCCR3 increased in differentiating bmEos and were all detected at ∼50- to 100-fold over baseline at day 17 in culture. In contrast, expression of transcripts encoding mouse neutrophil myeloperoxidase (mMPO) decreased ∼100-fold over the same interval (Fig. 2⇓A). Similarly, by day 17 of culture, expression of transcripts encoding the IL-5R α-chain and the IL-3/IL-5/GM-CSF receptor βc both increased ∼40- to 50- fold over values detected in undifferentiated bone marrow progenitors (day 0). No change in expression was observed for transcripts encoding IL-3 and the GM-CSF receptor α-chains (Fig. 2⇓B, note that the data points for IL-3Rα and GM-CSFRα are superimposed). Finally, we observe ∼100-fold elevated expression of the eosinophil-associated transcription factor GATA-1 at day 17, no change in expression of GATA-2, and prominent diminished expression of GATA-3 in from day 8 onward (Fig. 2⇓C). Transcripts expressed by differentiating bmEos in culture. Quantitative RT-PCR detection of transcripts encoding (A) mEPO (▪), mMBP (□), mCCR3 (•), and mMPO (○) on days of culture as indicated; (B) IL-5R α-chain (▪), IL-3 α-chain (□), GM-CSF receptor α-chain (•), and the IL-3/IL-5/GM-CSF receptor βc (○); note that the data points for IL-3Rα and GM-CSFRα are superimposed. C, Transcription factors GATA-1 (▪), GATA-2 (□), and GATA-3 (•). Expression of each transcript is normalized to GAPDH in every sample and reported as relative to its expression in freshly isolated bone marrow progenitors at day 0. Data are reported as mean ± SEM of three separate cultures. Chemotactic responses of bmEos (day 10) were evaluated as shown in Fig. 3⇓A. 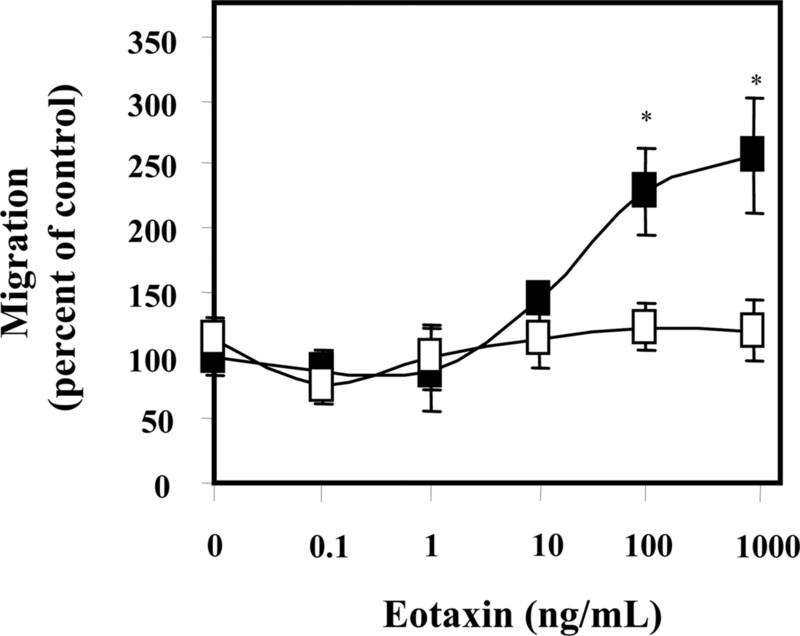 The percentage of bmEos that migrated along an established gradient of mouse eotaxin-1 (▪; amount in lower chamber as shown on x-axis) were as indicated, with significant values above baseline (no gradient) detected at 100 and 1000 ng/ml eotaxin-1. Similar results were obtained using bmEos from day 12 cultures (data not shown). Furthermore, mouse bmEos spontaneously synthesize and release cytokines in a manner analogous to their natural counterparts (17). Cytokines IFN-γ, IL-4, IL-6, MIP-1α, IL-9 and IFN-γ-inducible protein 10 were all detected in supernatants of bmEos that had been washed and cultured for 24 h in rmIL-5 (Table I⇓). bmEos exhibit chemotaxis toward recombinant mouse eotaxin-1. bmEos from day 10 cultures were used to measure chemotaxis in the presence of a mouse eotaxin-1 gradient (▪), determined as percentage of cells migrating over control (no eotaxin); chemokinesis (migration measured in response to eotaxin-1 in both chambers) is indicated by □. Indistinguishable results were obtained using bmEos from day 12 cultures. Mean ± SEM of three separate cultures. bmEos (day 10) were challenged with actively replicating or heat-inactivated PVM at the replication-permissive temperature of 32°C and virus replication was evaluated at the time points indicated (Fig. 4⇓A). A 4-fold increase in virus titer was observed after 96 h in response to PVM challenge, indicative of active replication. There was no evidence of virus replication in the control cultures challenged with heat-inactivated virus. Significantly higher concentrations of IL-6 were detected in the supernatants of bmEos cultures challenged with actively replicating than with heat-inactivated PVM or than with no virus challenge (Fig. 4⇓B). PVM infects bmEos. A, Day 10 bmEos cultures were challenged with actively replicating PVM or HI PVM and absolute copy number (per 106 copies GAPDH ± SEM) was determined. B, Responses of bmEos to challenge with PVM. Detection of IL-6 in supernatants of cultures of bmEos after 24 h challenge with actively replicating PVM, HI PVM, or control (No TX). Mean ± SEM of three separate cultures; **, p < 0.001 and *, p < 0.01. Day 3 differentiating bmEos cultures were challenged with lentivirus expressing emGFP (multiplicity of infection = 20) in the presence of polybrene. At day 7 of culture (4 days post transduction), expression of GFP was evident (Fig. 5⇓) and expression was maintained to day 9. Lentivirus-mediated transduction of bmEos. Differentiating bmEos (day 3) were transduced with lentivirus-expressing emGFP (multiplicity of infection = 20) and evaluated for green fluorescence 4 days later. A, Fluorescent image of bmEos (day 7 of differentiation) transduced with emGFP at day 3 in culture; original magnification, ×63. B, Flow cytometric determination of percent green fluorescent cells from transduced cells at 4 and 6 days after transduction; background levels of autofluorescence subtracted. In this work, we demonstrate a means to generate large numbers of differentiated eosinophils (bmEos) at high purity from normal, unselected BALB/c mouse bone marrow progenitors. With this approach, progenitors are cultured for 4 days in rmSCF and rmFLT3-L and then in rmIL-5 alone thereafter. FLT3-L has been characterized as an agent that promotes the growth of primitive, highly proliferative progenitors (18) and SCF likewise supports progenitor growth, including specifically eosinophil progenitors (19). This method represents a substantial improvement over our previous culture system (12) which included IL-3 and GM-CSF in addition to the aforementioned cytokines. This latter regimen promotes substantial replication but yields only a small fraction of eosinophils. IL-3 and GM-CSF are perceived as promoting eosinophil differentiation more or less directly (20), as human peripheral blood and bone marrow progenitors can differentiate into eosinophils in the presence of IL-3 and GM-CSF in the absence of IL-5 (21). However, it is interesting to note the findings of Dranoff and colleagues (22) who detected a 4-fold increase in peripheral blood eosinophils among mice that were null for both IL-3 and GM-CSF cytokines. The culture system presented here also represents an improvement over that explored by Ishihara et al. (13), in which unselected rat bone marrow progenitors were cultured in rIL-5 alone, with no additional support for primitive progenitors. This method yielded eosinophils in high purity (∼90%) but few in number, a finding consistent with the report of Yamaguchi et al. (23) demonstrating a role for IL-5 in terminal differentiation of committed progenitors only. The eosinophils differentiated from mouse bone marrow (bmEos) have normal morphology and express proteins (MBP protein, Siglec F, IL-5Rα) and transcripts encoding proteins that are known components of mature cells of this lineage. Among these is the mRNA encoding the transcription factor GATA-1, which undergoes accelerated expression at days 4–10 in bmEos culture, coincident with maximum eosinophil expansion and differentiation. GATA-1 drives immature myeloid progenitors to differentiate into eosinophils, erythroid cells, and megakaryocytes (24), and mice devoid of a palindromic enhancer in the hematopoietic promoter of the GATA-1 gene completely lack the eosinophil lineage (25). Concomitant with the increased expression of GATA-1, we see a decrease in the relative expression of GATA-3. The role of GATA-3 in promoting eosinophil development remains uncertain. GATA-3 binds to a consensus GATA site in the promoter of the gene encoding gp91phox, resulting in its diminished expression in the human eosinophilic cell line HL60-clone 15 (26). However, seemingly paradoxically, overexpression of GATA-3 in transgenic mouse models results in increased peripheral eosinophilia upon Th2 challenge (27, 28). Interestingly, we found that phenotypically mature bmEos maintain their ability to undergo cell division in culture. Indeed, although very few in numbers, we have identified eosinophils undergoing mitosis in eosinophils isolated from the spleen of BALB/c IL-5-transgenic mice (our unpublished data). This observation suggests that elevated levels of IL-5 might be promoting cell division in the periphery as well as differentiation from committed progenitors. bmEos also undergo chemotaxis in response to eotaxin-1 and synthesize cytokines analogous to those detected in their differentiated human counterparts (17). Given our long-term interest in the role of eosinophils in pneumovirus infection (2) and, in particular, the recent findings of Phipps et al. (9) demonstrating antiviral responses of eosinophils isolated from respiratory syncytial virus (RSV)-challenged mice, we explored the responses of differentiated bmEos to challenge with the natural mouse pathogen PVM, a pneumovirus that is closely related to RSV (29). We demonstrated here that bmEos are actively infected with PVM and we detected elevated quantities of the cytokine IL-6 in supernatants of PVM-infected bmEos cultures. Eosinophils are active participants in primary RSV infection (30, 31) in the allergic responses to the formalin-fixed RSV vaccine formulation (32), and eosinophils are recruited to mouse lung tissue in response to acute infection with PVM (33). Although eosinophils interact specifically with RSV (34), this is the first clear demonstration that pneumoviruses can infect and undergo replication within these cells. Likewise, although the nature of its role in the virus-induced inflammatory process is not clear, synthesis and secretion of IL-6 is a prominent response of respiratory epithelial cells and monocytes infected with RSV (35, 36, 37, 38, 39), and recently Lindemans et al. (40) detected IL-6 in culture supernatants from RSV-challenged human granulocytes. Interestingly, IL-6 has recently been implicated as a factor contributing to the severity of disease in the respiratory distress- lung injury model in mice (41). Finally, we found that differentiating bmEos can be transduced with the emGFP-containing lentiviral vector. This result suggests that lentivirus-mediated genetic alterations may be conducted in these ex vivo cultures, thereby clearing the way for the generation of large numbers of highly pure gene-manipulated eosinophils for reconstitution experiments. This method might also be used to explore the impact of specific gene manipulations on eosinophil development and differentiation. In summary, we report here a means for the optimization of both yield and purity of mature eosinophils from unselected mouse bone marrow progenitors. The bmEos are fully differentiated when evaluated on the basis of morphology, molecular expression, and function. bmEos can be infected with and promote replication of the natural pneumovirus pathogen PVM, resulting in specific cytokine secretion. We plan to use bmEos- and lentivirus-mediated overexpression and/or silencing to understand eosinophil development and the interactions of eosinophils with respiratory virus pathogens in vitro and in vivo. We thank Dr. Nancy A. Lee and Dr. James J. Lee for the generous gift of polyclonal anti-mouse anti-MBP Ab. ↵1 This work was funded by the NIAID Division of Intramural Research. ↵3 Abbreviations used in this paper: βc, common β-chain; PVM pneumonia virus of mice; bmEos, bone marrow-derived eosinophil; SCF, stem cell factor; rm, recombinant mouse; m, mouse; EPO, eosinophil peroxidase; MBP, major basic protein; MPO, myeloperoxidase; DAPI, 4′,6-diamidino-2-phenylindole; HI, heat inactivated; RSV, respiratory syncytial virus. Lee, J. J., N. A. Lee. 2005. Eosinophil degranulation: an evolutionary vestige or a universally destructive effector function?. Clin. Exp. Allergy 35: 986-994. Rosenberg, H. F., J. B. Domachowske. 2001. Eosinophils, eosinophil ribonucleases, and their role in host defense against respiratory virus pathogens. J. Leukocyte Biol. 70: 691-698. Jacobsen, E. A., S. I. Ochkur, N. A. Lee, J. J. Lee. 2007. Eosinophils and asthma. Curr. Allergy Asthma Rep. 7: 18-26. Matsumoto, K., M. Tamari, H. Saito. 2008. Involvement of eosinophils in the onset of asthma. J. Allergy Clin. Immunol. 121: 26-27. Rosenberg, H. F., S. Phipps, P. S. Foster. 2007. Eosinophil trafficking in allergy and asthma. J. Allergy Clin. Immunol. 119: 1303-1312. Leckie, M. J.. 2003. Anti-interleukin-5 monoclonal antibodies: preclinical and clinical evidence in asthma models. Am. J. Respir. Med. 2: 245-259. O'Byrne, P. M., M. D. Inman, K. Parameswaran. 2001. The trials and tribulations of IL-5, eosinophils, and allergic asthma. J. Allergy Clin. Immunol. 108: 503-508. Kumar, R. K., H. F. Rosenberg, K. A. Asquith, and P. S. Foster. 2008. Targeting eosinophils in asthma. Curr. Mol. Med. In press. Phipps, S., C. E. Lam, S. Mahalingam, M. Newhouse, R. Ramirez, H. F. Rosenberg, P. S. Foster, K. I. Matthaei. 2007. Eosinophils contribute to innate antiviral immunity and promote clearance of respiratory syncytial virus. Blood 110: 1578-1586. Bystrom, J., K. D. Dyer, S. S. Ting-De Ravin, N. Naumann, D. A. Stephany, P. S. Foster, T. A. Wynn, H. F. Rosenberg. 2006. Interleukin-5 does not influence differential transcription of transmembrane and soluble isoforms of IL-5Rα in vivo. Eur. J. Haematol. 77: 181-190. Swartz, J. M., K. D. Dyer, A. W. Cheever, T. Ramalingam, L. Pesnicak, J. B. Domachowske, J. J. Lee, N. A. Lee, P. S. Foster, T. A. Wynn, H. F. Rosenberg. 2006. Schistosoma mansoni infection in eosinophil lineage-ablated mice. Blood 108: 2420-2427. Dyer, K. D., M. Czapiga, B. Foster, P. S. Foster, E. M. Kang, C. M. Lappas, J. M. Moser, N. Naumann, C. M. Percopo, S. J. Siegel, et al 2007. Eosinophils from lineage-ablated ΔdblGATA bone marrow progenitors: the dblGATA enhancer in the promoter of GATA-1 is not essential for differentiation ex vivo. J. Immunol. 179: 1693-1699. Ishihara, K., I. Satoh, S. Mue, K. Ohuchi. 2000. Generation of rat eosinophils by recombinant rat interleukin-5 in vitro and in vivo. Biochim. Biophys. Acta 1501: 25-32. Ellis, J. A., B. V. Martin, C. Waldner, K. D. Dyer, J. B. Domachowske, H. F. Rosenberg. 2007. 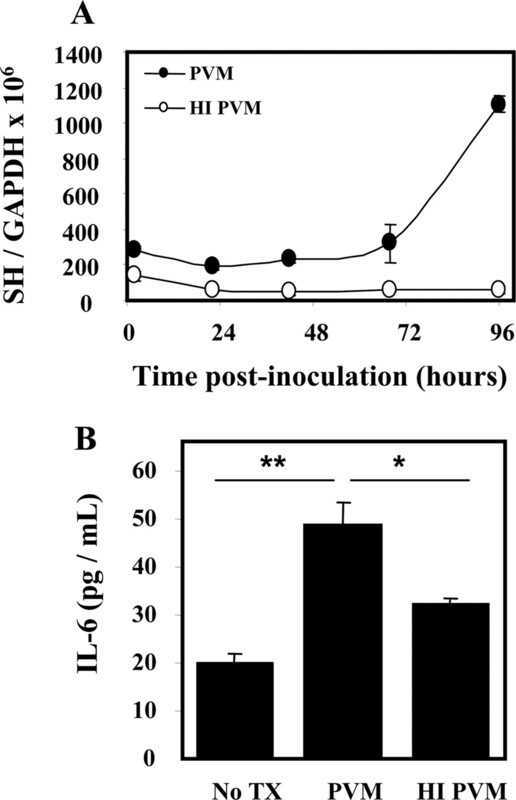 Mucosal inoculation with an attenuated mouse pneumovirus strain protects against virulent challenge in wild type and interferon-γ receptor deficient mice. Vaccine 25: 1085-1095. Varga, S. M., N. A. Beckman, M. Chu, T. J. Braciale. 2002. Sensitive detection and quantitation of mouse eosinophils in tissues using an enzymatic eosinophil peroxidase assay: its use to rapidly measure pulmonary eosinophilia during experimental respiratory syncytial virus infection of mice. J. Immunol. Methods 262: 111-120. Lacy, P., R. Moqbel. 2000. Eosinophil cytokines. Chem. Immunol. 76: 134-155. Hudak, S., B. Hunte, J. Culpepper, S. Menon, C. Hannum, L. Thompson-Snipes, D. Rennick. 1995. FLT3/FLK2 ligand promotes the growth of murine stem cells and the expansion of colony-forming cells and spleen colony-forming units. Blood 85: 2747-2755. Metcalf, D., S. Mifsud, L. Di Rago. 2002. Stem cell factor can stimulate the formation of eosinophils by two types of murine eosinophil progenitor cells. Stem Cells 20: 460-469. Takamoto, M., K. Sugane. 1995. Synergism of IL-3, IL-5, and GM-CSF on eosinophil differentiation and its application for an assay of murine IL-5 as an eosinophil differentiation factor. Immunol. Lett. 45: 43-46. Rosenberg, H. F., K. D. Dyer, F. Li. 1996. Characterization of eosinophils generated in vitro from CD34+ peripheral blood progenitor cells. Exp. Hematol. 24: 888-893. Gillessen, S., N. Mach, C. Small, M. Mihm, G. Dranoff. 2001. Overlapping roles for granulocyte-macrophage colony-stimulating factor and interleukin-3 in eosinophil homeostasis and contact hypersensitivity. Blood 97: 922-928. Yamaguchi, Y., T. Suda, J. Suda, M. Eguchi, Y. Miura, N. Harada, A. Tominaga, K. Takatsu. 1988. Purified interleukin 5 supports the terminal differentiation and proliferation of murine eosinophilic precursors. J. Exp. Med. 167: 43-56. Kulessa, H., J. Frampton, T. Graf. 1995. GATA-1 reprograms avian myelomonocytic cell lines into eosinophils, thromboblasts, and erythroblasts. Genes Dev. 9: 1250-1262. Yu, C., A. B. Cantor, H. Yang, C. Browne, R. A. Wells, Y. Fujiwara, S. H. Orkin. 2002. Targeted deletion of a high-affinity GATA-binding site in the GATA-1 promoter leads to selective loss of the eosinophil lineage in vivo. J. Exp. Med. 195: 1387-1395. Sadat, M. A., A. Kumatori, S. Suzuki, Y. Yamaguchi, Y. Tsuji, M. Nakamura. 1998. GATA-3 represses gp91phox gene expression in eosinophil-committed HL-60-C15 cells. FEBS Lett. 436: 390-394. Ozawa, H., H. Tamauchi, M. Ito, M. Terashima, M. Inoue, K. Hozumi, S. Habu, N. Watanabe. 2005. Immune responses to Nippostrongylus brasiliensis and tuberculin protein in GATA-3-transgenic mice. Immunol. Lett. 99: 228-235. Watanabe, N., H. Tamauchi, H. Ozawa, M. Ito, Z. Ovary, S. Habu. 2003. Th2 immune responses in GATA-3-transgenic mice infected with Heligmosomoides polygyrus. Int. Arch. Allergy Immunol. 131: (Suppl. 1):11-14. Easton, A. J., J. B. Domachowske, H. F. Rosenberg. 2004. Animal pneumoviruses: molecular genetics and pathogenesis. Clin. Microbiol. Rev. 17: 390-412. Harrison, A. M., C. A. Bonville, H. F. Rosenberg, J. B. Domachowske. 1999. Respiratory syncytial virus-induced chemokine expression in the lower airways: eosinophil recruitment and degranulation. Am. J. Respir. Crit. Care Med. 159: 1918-1924. Garofalo, R., J. L. Kimpen, R. C. Welliver, P. L. Ogra. 1992. Eosinophil degranulation in the respiratory tract during naturally acquired respiratory syncytial virus infection. J. Pediatr. 120: 28-32. Domachowske, J. B., H. F. Rosenberg. 1999. Respiratory syncytial virus infection: immune response, immunopathogenesis, and treatment. Clin. Microbiol. Rev. 12: 298-309. Domachowske, J. B., C. A. Bonville, K. D. Dyer, A. J. Easton, H. F. Rosenberg. 2000. Pulmonary eosinophilia and production of MIP-1α are prominent responses to infection with pneumonia virus of mice. Cell. Immunol. 200: 98-104. Kimpen, J. L., R. Garofalo, R. C. Welliver, K. Fujihara, P. L. Ogra. 1996. An ultrastructural study of the interaction of human eosinophils with respiratory syncytial virus. Pediatr. Allergy Immunol. 7: 48-53. Arnold, R., B. Humbert, H. Werchau, H. Gallati, W. Konig. 1994. Interleukin-8, interleukin-6, and soluble tumour necrosis factor receptor type I release from a human pulmonary epithelial cell line (A549) exposed to respiratory syncytial virus. Immunology 82: 126-133. Arnold, R., B. Konig, H. Galatti, H. Werchau, W. Konig. 1995. Cytokine (IL-8, IL-6, TNF-α) and soluble TNF receptor-I release from human peripheral blood mononuclear cells after respiratory syncytial virus infection. Immunology 85: 364-372. Becker, S., J. Quay, J. Soukup. 1991. Cytokine (tumor necrosis factor, IL-6, and IL-8) production by respiratory syncytial virus-infected human alveolar macrophages. J. Immunol. 147: 4307-4312. Jiang, Z., M. Kunimoto, J. A. Patel. 1998. Autocrine regulation and experimental modulation of interleukin-6 expression by human pulmonary epithelial cells infected with respiratory syncytial virus. J. Virol. 72: 2496-2499. Matsuda, K., H. Tsutsumi, S. Sone, Y. Yoto, K. Oya, Y. Okamoto, P. L. Ogra, S. Chiba. 1996. Characteristics of IL-6 and TNF-α production by respiratory syncytial virus-infected macrophages in the neonate. J. Med. Virol. 48: 199-203. Lindemans, C. A., P. J. Coffer, I. M. Schellens, P. M. de Graaff, J. L. Kimpen, L. Koenderman. 2006. Respiratory syncytial virus inhibits granulocyte apoptosis through a phosphatidylinositol 3-kinase and NF-κB-dependent mechanism. J. Immunol. 176: 5529-5537.